Hurricane season is officially upon us! Now is the time of year where the weather can really kick up and wreak havoc on your home. Your roof, which is solely responsible for protecting you, your family, and everything you own inside your home, bears the brunt of this weather. Whether it’s high winds, heavy rains, or battering hail, your roof has to stand up to a lot. The Roof Authority is your trusted source for roof repair, roof maintenance, or an entirely new roof. When bad weather strikes, we have a 24-hour rapid response team who can provide emergency roof repair services. Fort Pierce residents are in the best hands with The Roof Authority. Call us at (772) 468-7870 or contact us for a free quote today. Read on for the types of damage bad weather can cause. Heavy wind, even if it’s not hurricane-force, can really harm the integrity of your roof. Shingles can come loose and even fly off completely. When the shingles can’t protect the structure underneath, the accompanying rain and elements will seep in. Even if you don’t see visible water, you should definitely have your roof inspected by a trained professional to ensure that moisture hasn’t damaged the wood underneath. Rain, especially the deluges that come with hurricanes, can do terrible things to your home. When you have existing roof damage or forceful winds, the rain can find its way inside. This can lead to rotting wood and drywall, mold, weakened structure, and flooding. The moment you notice any loss of integrity in your shingles, or have any hint of moisture, call The Roof Authority to assess the damage. Hail can be as small as a pea or as big as a softball. But when it comes to what hail does to your roof, even the smallest granules can cause damage over prolonged periods of time. Hailstones that are one inch in diameter will likely cause serious issues, while hailstones bigger than that can result in destruction. Having the damage assessed as soon as possible can single out issues that you can’t see from the ground with the naked eye. A trained professional roof contractor will be able to spot issues, and perform repairs. Sun, while technically not weather, can dry out your shingles and cause them to crack over time. 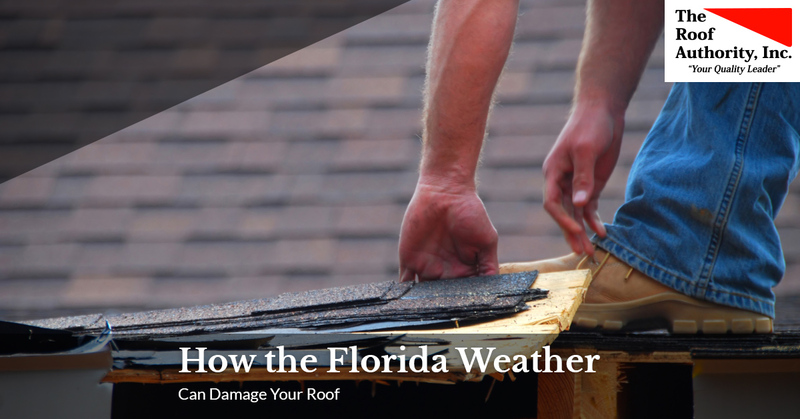 Florida is blessed with a wonderful about of sunshine throughout the year, but the heat and rays will deteriorate your roof. Cracks, warping, decay, and issues that result from broken and missing shingles will result as a side effect. When your roof falls victim to age, it’s time to replace them all over. Be careful of the fly-by-night “roofing contractors” who sweep through town after a storm. Go with somebody you trust, who’s been in the area for the long run. The Roofing Authority has been in business since 1993, and has a proven record of excellence. Call us today when you need roof repair or to replace a roof. We are Fort Pierce’s leading roofing contractors.